3 Vitamin D3 Is More Important Than We Think? 4 Is Supplemental Vitamin D3 safe? 8.1 Question: There is no evidence to show that vitamin D3 is effective against cancer? Vitamin D3 supplementation is correlated with a reduction in all-cause mortality, and a reduction in cancer mortality. Vitamin D supplementation for prevention of mortality in adults by Bjelakovic G et. al. Accordingly, 56 randomised trials with 95,286 participants provided usable data on mortality. Vitamin D3 statistically significantly decreased cancer mortality (RR 0.88 (95% CI 0.78 to 0.98); P = 0.02; I(2) = 0%; 44,492 participants; 4 trials). In plain english, if you take Vitamin D, the relative risk of developing cancer is somewhere between 78% and 95% of someone who does not take vitamin D. This is a pretty wide range, so we wanted to pin a single number on it, we would say that we are confident that its around about 88%, or a 12% reduction in risk. A 12% reduction in risk is huge: if we randomly pick 100,000 people who died from cancer, then 12,000 of would not have died of cancer if they had either taken vitamin D3 or had sufficient sunlight. However, what about melanoma? Everybody knows that if sunburn can lead to skin cancer, so we should always use sunscreen? Correct? No. Absolutely, no, no, no. This belief is misleading at best, and plain wrong at worst. No sun increases your risk of developing cancer due to lack of Vitamin D, which could lead to death due to cancer. Too much sun mildly increases your risk of developing melanoma which could lead to death due to skin cancer. For every 2 people who die of skin cancer, over 400 die of general cancer due to lack of vitamin D [cite paper with these statistics]. In other words, the increase in all-cause mortality from lack of vitamin D vastly outweighs the increase in all-cause mortality from melanoma by a factor of 100, which means that the sunscreen song is wrong (4). In any case, there is a safe and effective cure for melanoma. To put it simply, avoiding all sunlight is like continuing to smoke because you are afraid of dying of stress. Because everyone knows that smoking calms you down, right? Vitamin D3 Is More Important Than We Think? The author reviewed over 30,000 articles from www.pubmed.org, and has self experimented with higher doses of Vitamin D (6) which fixed an impressively long list of his own health problems. Other people have replicated his experiment with positive results: his book has over 165 reviews on Amazon as of late 2015 and almost all of them are 5 stars. If there is any criticism of the book, it is that it is written written in an unusual style, almost like a stream of consciousness. However, although the author makes some bold claims, he backs them up with evidence from www.pubmed.org. Despite his unusual style, the author is no intellectual slouch: he currently holds the world record for the longest living mouse, using water restriction instead of calorie restriction (6). Is Supplemental Vitamin D3 safe? However, according to Jeff T. Bowles, hypercalcemia will not occur if Vitamin K2 is taken as well (6). Patients have taken 1,000,000 IU of Vitamin D per day by mistake, for months and once this dosage ceased all negative side effects disappeared (6). There are no known cases of death due to Vitamin D overdosing [citation required]. If you spend 15 minutes in the sun, your skin creates 20,000 IU of Vitamin D which is well above 5,000 IU we are taking orally. Supplemental Vitamin D3 significantly decreases cancer mortality, and will decrease your all-cause chance of death by almost much as quitting smoking would (1). Take 4,000 IU of Vitamin D3 per day (2), especially during the winter when vitamin D levels are low as there is insufficient sunlight on the skin to create it. Take doses of up to between 25,000 and 100,000 IU per day, and get regular blood tests performed to ensure that your Vitamin D levels tested to ensure they are within safe limits. This is entirely safe, see The Miraculous Results of Extremely High Doses of the Sunshine Hormone Vitamin D3: My experiment with huge doses of D3 from 25,000 to 50,000 to 100,000 IU a day over a 1 Year Period by Jeff T. Bowes. If you do decide to take this dosage option, ensure that you read the book and study the referenced articles from www.pubmed.org. There are other considerations, such as taking Vitamin K2 and Magnesium. On the NHS [the Health Service in the United Kingdom] you can only get your blood tested for vitamin D every 6 months IF (and it’s a big IF) your GP decides to pay for it. See uctv.tv on Vitamin D (5). There are many other videos on this site relating to Vitamin D.
Question: There is no evidence to show that vitamin D3 is effective against cancer? This is the wrong question. This is also incorrect. If you hear somebody use these exact words, then they trying to dismiss vitamin D3 as a factor related to cancer. The answer to these two questions is yes, and yes, because there is overwhelming evidence that supplemental vitamin D3 is a factor in cancer prevention (1) (3) (5). There have been large scale, double blind medical studies for vitamin D3 and cancer (3), and the probability that vitamin D3 is a factor in preventing both cancer and all-cause mortality is 100% for all practical purposes. (1) Mortality in relation to smoking: 50 years’ observations on male British doctors. BMJ 2004; 328. See http://www.bmj.com/content/328/7455/1519. (2) Linus Pauling Institute – Micronutrient Information Center – Vitamin D. See http://lpi.oregonstate.edu/mic/vitamins/vitamin-D.
(3) Vitamin D supplementation for prevention of mortality in adults, Cochrane Database Syst Rev. 2014 Jan 10 by Bjelakovic G et. al. See http://www.ncbi.nlm.nih.gov/24414552. (5) Vitamin D and Sunlight for Cancer Prevention. Vitamin D for Public Health – Integrating Sunshine, Supplements and Measurement for Optimal Health 2014. Premiere Date: 3/11/2015; 44 minutes. See http://uctv.tv/shows/Vitamin-D-and-Sunlight-for-Cancer-Prevention-29078. 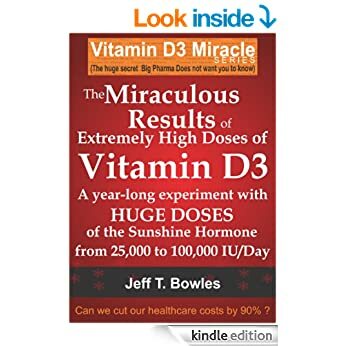 (6) See eBook entitled “The Miraculous Results of Extremely High Doses of the Sunshine Hormone Vitamin D3: My experiment with huge doses of D3 from 25,000 to 50,000 to 100,000 IU a day over a 1 Year Period” by Jeff T. Bowes. Copyright © 2019 Beat the Cancer Odds. Powered by WordPress. Theme: Spacious by ThemeGrill.